Range restricted endemic. Although much of the range is transformed by forestry plantations, plantations have not affected the cliffs and rocky outcrops where this species grows. It is very common, consisting of large subpopulations, and is not declining. Waterval Boven to Pilgrim's Rest. Grassland, found in shallow soils on exposed dolomite outcrops and cliff faces. A. alooides is near endemic to Northern Escarpment Dolomite Grassland, a vegetation type classified as Endangered (Mucina and Rutherford 2006) of which at least 52% is transformed, mainly by commercial forestry plantations. A. alooides is one of the slowest growing Aloe species (Glen and Hardy 2000), indicating that it is very long-lived. This species could, therefore, possibly be listed as a threatened species under the A criterion due to extensive habitat loss within three generations. However, cliff faces and the extremely shallow soils of the rocky outcrops where this species grows are highly unsuitable to forestry, and it is, therefore, unlikely that forestry has had a direct impact on populations. The species is very common within its distribution range, with some very large populations in the southern part of the range (Reynolds 1969, M. Lötter pers. comm.) and do not appear to be threatened or declining. The flowers of A. alooides is very unique within the genus Aloe, and also the smallest, measuring only about nine millimetres long (Reynolds 1969). The first description of the species by Harry Bolus in 1881 was based only on a collection of the inflorescence with no notes on the leaves or habit. The strange flowers caused much confusion � it resembled that of Urginea, a genus of small, inconspicuous bulbous plants in the family Hyacinthaceae, but also had characters typical of Aloe. 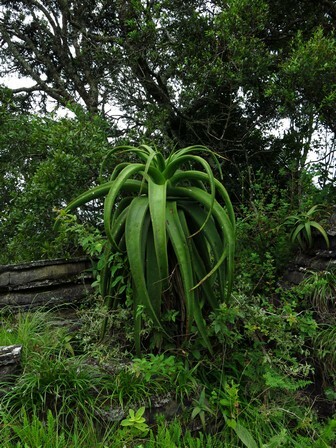 Bolus decided to place the species in the genus Urginea under the name Urginea alooides, which means 'the Urginea that looks like an Aloe' (Glen and Hardy 2000). A better specimen was collected by I.B. Pole-Evans in 1921, and based on this material Aloe recurvifolia was described (Reynolds 1969). 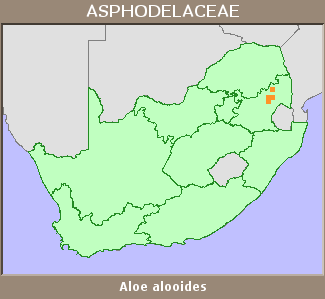 It was only later realized that the names Urginea alooides and Aloe recurvifolia represents the same species, but due to the rules of taxonomical nomenclature, earlier names take preference, and so when Urginea alooides was transferred to the genus Aloe it became Aloe alooides, or, 'the Aloe that looks like an Aloe'. There are very few collections of A. alooides in herbaria. This should not be taken as an indication of rarity. It is more likely the result of the difficulty in pressing the 1 m+ long fleshy leaves (M. Lötter pers. comm. ).